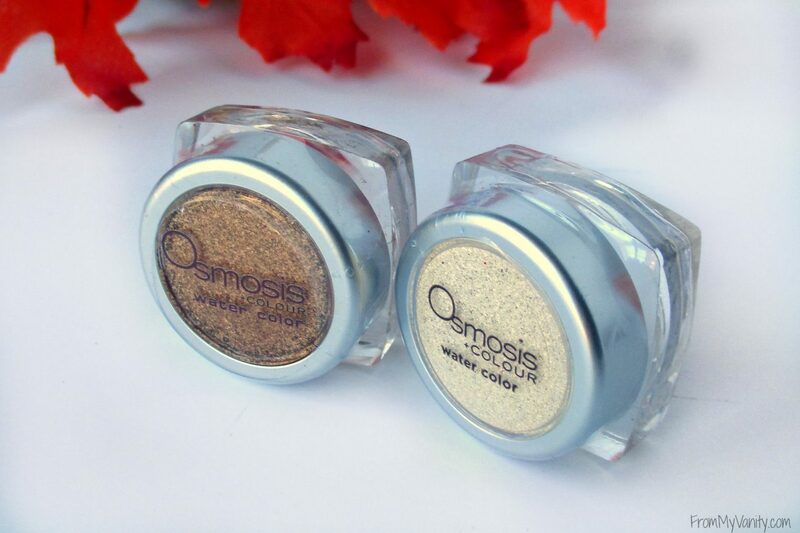 If you saw my Instagram picture 2 weeks ago, you know I was all excited about the Osmosis Water Color High Intense Loose eyeshadow in Topaz. It has continued to be my most reached for pigment this month — it’s just so appropriate and perfect for fall! Want to see how these gorgeous and unique shadows performed on my lids? Keep reading! 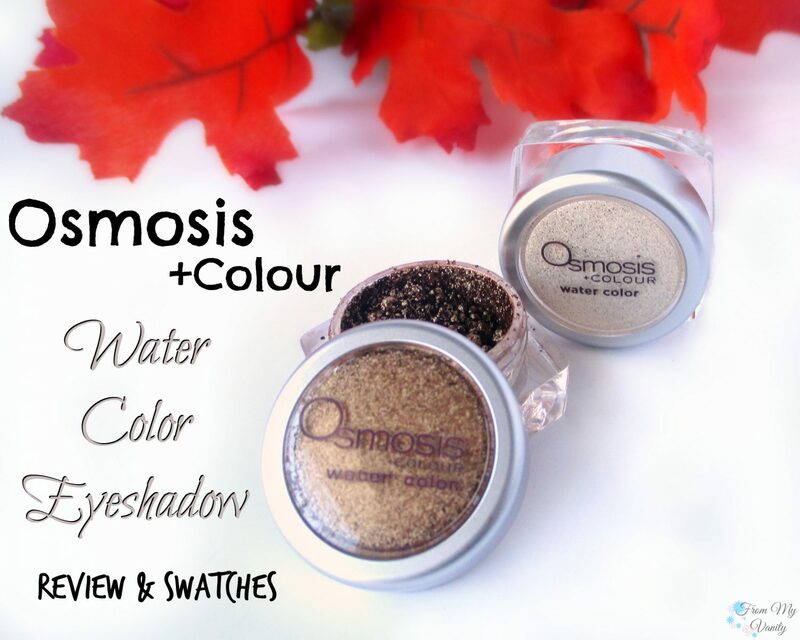 Water Colors for your eyes are a great addition to the Colour collection. This hydrating formula offers a radiant glimmer of color to the eyelids that won’t crease. Infused with Green Tea, Vitamins A,C,E and our exclusive Goji Berry blend to nurture and add healing benefits to the eye area. Let me just start off this review by saying how unique these eyeshadows are! They’re not like the typical eyeshadow (which is obvious from the pictures, I’m sure), and yet they’re not like a typical loose shadow or pigment, either. They really are in a league all their own and I am thrilled and fascinated with them! As mentioned already above, these eyeshadows are infused with a lot of beneficial ingredients that are supposed to offer hydration and healing properties to the skin while wearing them. Which is awesome for my dry-skinned gals. Even if you don’t have super-dry skin (like me) I found that at the end of the day my eyeshadow still looked fabulous and fresh as when I first applied it. There were no ‘dry patches’ anywhere, which I can get (especially in my inner corners) after wearing an eye look for a really long day. So these Water Color shadows are a loose-type of eyeshadow that appears to be in hundreds of tiny balls inside the containers. I wasn’t really sure which way would be the best way to apply these, but found (after a little experimenting) that using my finger really was best. I would lightly tap into the container (not pressing hard, at all) and pick up a few of the pigments and ‘balls’. Even if it didn’t look like much on my hand…the moment I pressed it against my eyelid (or hand, for a swatch) BAM! Instant, pigmented, and beautiful color! 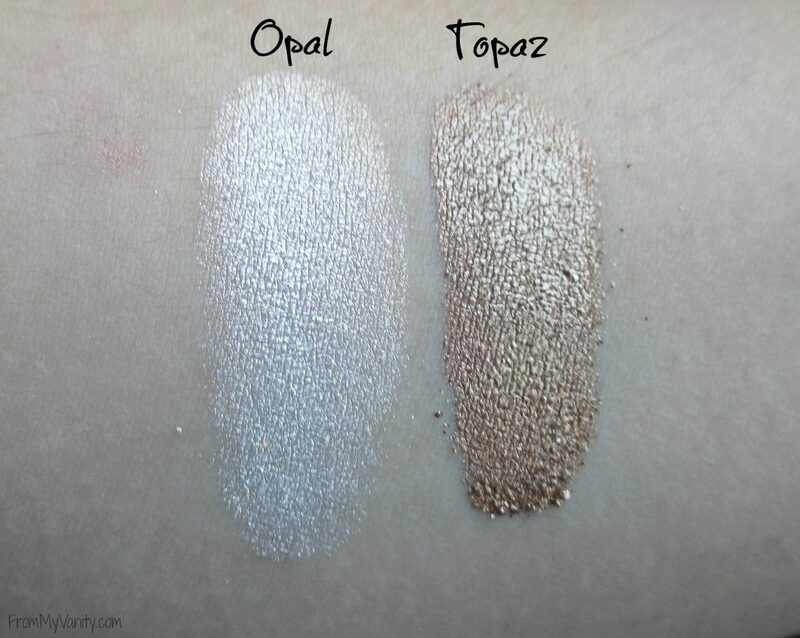 I think you’re able to tell in both of these swatch pictures, but Topaz was just a tad more pigmented and intense than Opal. Not really anything super noticeable or a problem when applying — it still applied beautifully and was just as vivid as Topaz. 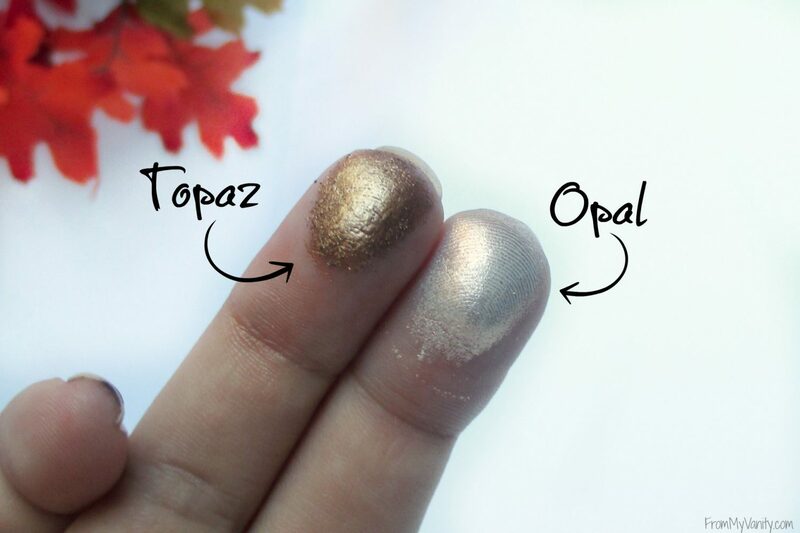 Also, something really unique about Opal was that I noticed if I applied it over a warm-toned eyeshadow look, the color came off more golden-y. If I applied it over a cool-toned eyeshadow look, than it appeared more white. I thought this was such a cool aspect to the Opal color — how versatile! There is a good bit of fall out with these shadows, which I was expecting because of the consistency of the shadows. But I actually found that, because these products are mostly in ‘balls’ before being pressed onto the skin, they were really easy to sweep off of my face with a fan brush and not leave behind a ton of shimmer. I would still recommend doing your eyes before your face makeup when using this product! 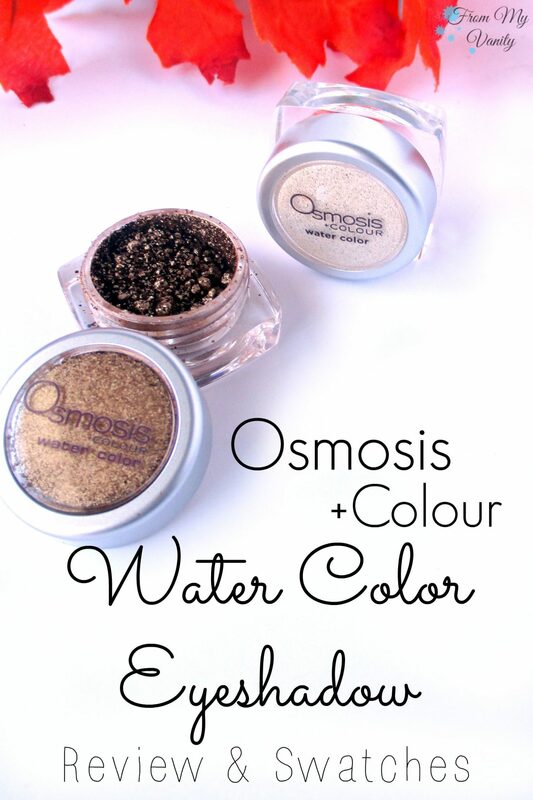 If you follow me on Instagram you saw me post my eye look featuring the Osmosis +Colour Water Color in Topaz. Isn’t it breathtaking?! 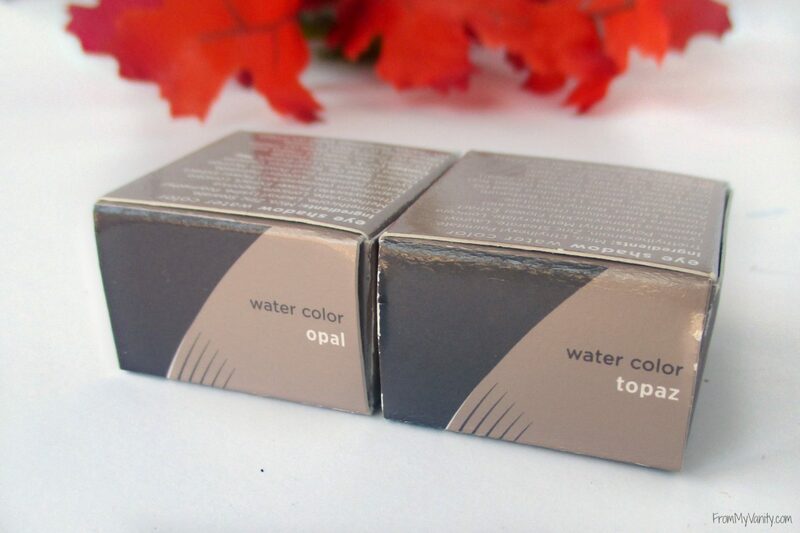 The color Opal also performs just as beautifully and stunning on the lids, but you know Topaz has my heart right now! Have you heard about these eyeshadows before? Do you think you’d like this unique formula? Let me know below! I received the products mentioned above from Osmosis Skincare, though there was no guarantee that I would feature them on my blog. All thoughts are 100% my own. Some affiliate links were used. 🙂 Thank you for your support! these look absolutely amazing!!! I don’t have a lot of experience with loose pigments because they seem so messy, but I’m drooling over some duochrome ones lately! the pigmentation is incredible! Gorgeous on you and gorgeous holiday shades! I have two lipsticks, brow pencil and gel, and the fabulous mascara. I’m blown away by their makeup! The formula sounds so unique, and I love the way they look on your lids!! These shadows look so pigmented and gorgeous! I totally think I need to try this brand. Seriously stunning shades on you! The Topaz color is gorgeous! And the look you created with these shadows is stunning! Yowza, those are gorgeous! I especially like the Topaz one! My gosh these are pretty. LOVE the eye look! Well those are certainly shades of colour that you can’t miss, I think topaz is the better shade but that is only because I can see it more clearly. Stunning shades on you! I have never heard of the brand but DAMN, great first impressions from me. WHOA PIGMENT! Gorgeous! I absolutely love.